Newer: » What’s New: Welcome to Sergeant Duke’s Beachside Grill & Bar! Belize City, Monday, June 12th, 2017: The Belize Tourism Board (BTB) has won the prestigious Innovation & Creativity Award of the Latin American Travel Association (LATA) based in London, the United Kingdom for its Belize Virtual Expo, the first of its kind in Belize. 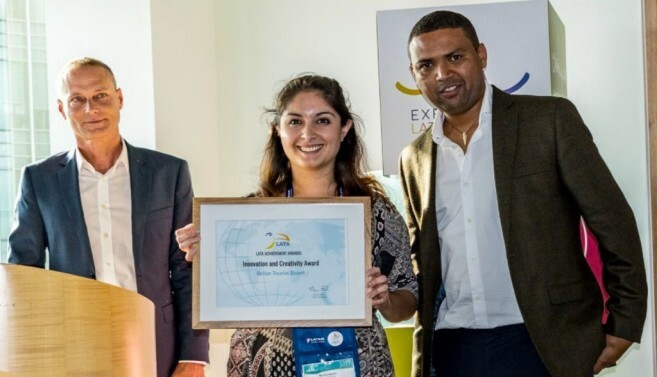 The award was presented today to the Brighter Group, the BTB’s Public Relation’s firm in the UK, at the Experience Latin America (ELA) trade show, which is taking place in London from June 12-14 and organized by LATA. The Brighter Group is representing BTB at the show and received the award on BTB’s behalf. “Belize is a growing, viable and a must-go destination in the Caribbean and Latin American Travel Market. This award is a testament of how the BTB is ensuring that Belize is promoted effectively with great innovation and creativity to the European market and beyond,” Ms Karen Pike, BTB’s Director of Marketing and Industry Relations, said. The award was granted to BTB for its Belize Virtual Expo, which will be held at the Biltmore Plaza Hotel on 29th – 30th June. The Virtual Expo aims to give local tourism service providers an opportunity to meet "virtually" with key representatives of the international travel trade. The Expo is targeting travel agents, tour operators and wholesalers originating from Belize’s major tourism markets, namely North America, Europe, South America and Central America. Other industry partners such as international associations, Meetings, Incentives, Conferences, and Events (MICE) agencies, press and other industry professionals have also been invited to attend. The theme for the Expo is Discover the Best of Belize’s Jungle and Beach. It will be a live event that will take place in an online environment. The Expo is equivalent to a conventional trade show, except suppliers and buyers connect with each other via the internet, regardless of their geographic location, to exchange valuable information. Experience Latin America (ELA) is an exciting travel event bringing together key suppliers from Latin America with buyers from the UK and Europe in London. By invitation only, and organized by Latin America’s largest travel trade association, the three-day event is bringing together carefully-selected companies wishing to increase business to Latin America. LATA was created in 1996 to develop better working relationships and improve communications with Latin American travel businesses to promote Latin America as a tourist destination. Over the years, LATA has grown from strength to strength and is now an authoritative voice for Latin American travel and tourism. The Virtual Expo is a historic event for Belize and the LATA award will boost BTB’s marketing efforts in promoting Belize as a growing, viable and a must-go destination in the Caribbean and Latin American Travel Market.